Are you a GoNoodle fan?!?! I LOVE using it with my students and they LOVE it! We always do a GoNoodle video after lunch. This really helps to get our wiggles out and our brains ready for reading. Some of their favorites are Maximo, Zumba, and MooseTube! Besides GoNoodle being absolutely AWESOME, it is also free! You just have to sign-up and create your account to get started. I also email my families the link because they can get on GoNoodle at home too. My students recently maxed out their GoNoodle champ and they were super excited! If you didn't already know, the GoNoodle website has a FREE GoNoodle Art Pack. You can download your own GoNoodle champ clipart. I love clipart so I had to have some GoNoodle clipart! 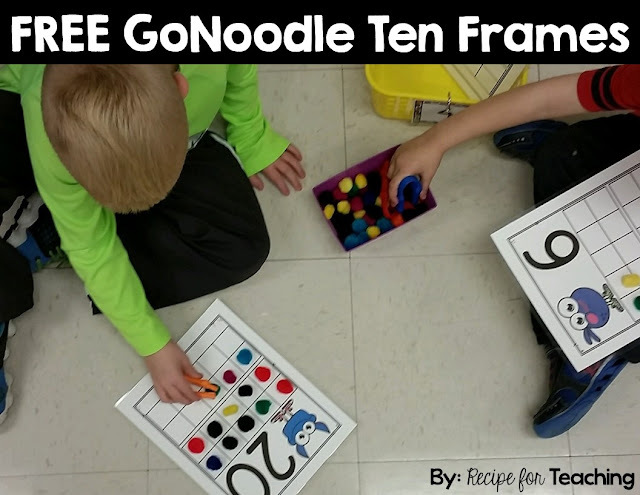 I had the idea to use this awesome clipart to make some GoNoodle ten frames and counting mats for my students to use. I thought they would be perfect for math stations! 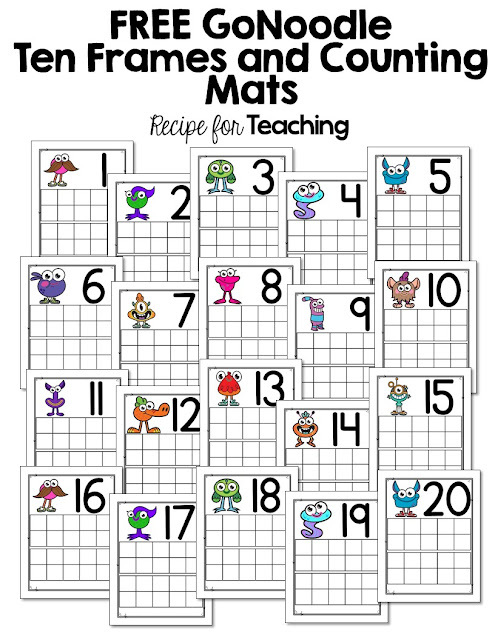 I created counting mats 1-20. I am going to have my students use manipulatives to practice counting with these mats. I also created 1-10 ten frames and number cards. These could be used as a matching game, using the ten frame cards to tell how many, telling how many more to make ten, etc. I am so excited to show these to my students and I wanted to share this with YOU! Just click the picture below to download your freebie! I hope you enjoy it and Happy GoNoodling!